The Marvel Universe is quite vast thanks to it's many locations from Earth to Asgard along with the many alien planets and alternate universes. The Guardians of the Galaxy provide commentary on the known Marvel Universe. The Hidden Universe Travel Guides: The Complete Marvel Cosmos is a Marvel history lovers dream. The attention to various locations alone is staggering as newer locations such as the Quiet Room and the Alpha Flight space station are included. I was surprised to see the inclusion of alternate universes as the majority are only visited once over a short period of time. The Complete Marvel Cosmos is a solid book full of the tidbits honorary Marvel historians live for. 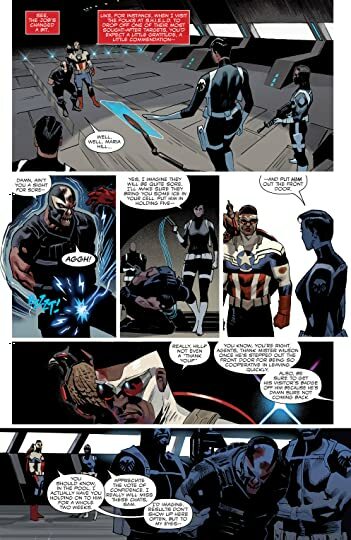 Sam Wilson, formerly Captain America's sidekick Falcon, has donned the name of Captain America. Because of a few I'll advised choices Sam finds himself without the support of SHIELD and with the general public angry at him. He's a super hero on a budget now. I've given Sam Wilson a few tries as Captain America and I'm just not a fan. Something about him is lacking in the role. The storyline in this issue wasn't overly compelling as it takes a shallow yet realistic look at political issues the country is facing and how corporations are able to get away with a lot because of their role in the economy. It's weird seeing a supervillain rant about corporate profit structure and the nature of business in such a detailed sense. I don't imagine younger readers would have any appreciation for this, but perhaps the politics would go over their heads and therefore lead them to simply see kicks and punches. The storyline isn't one I'm particularly interested in either though. The title says it best, Sam Wilson is Not My Captain America.